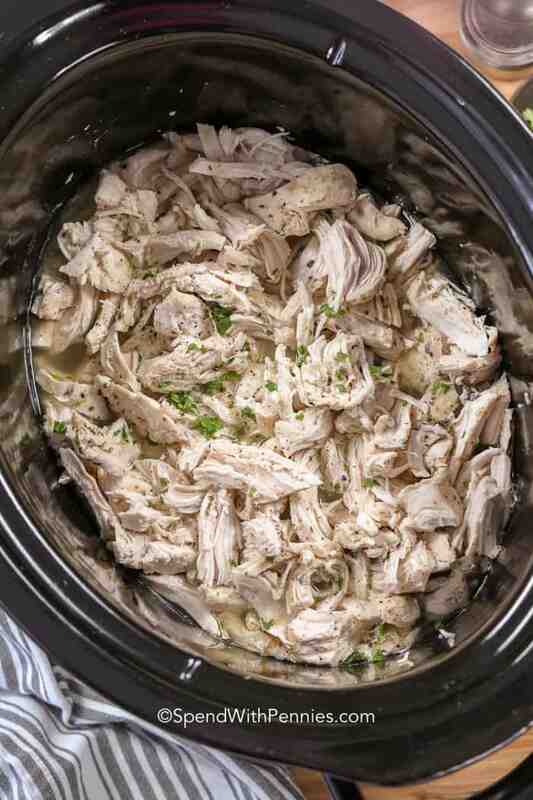 Crockpot shredded chicken is my favorite way to make an easy lunch, dinner, or snack. 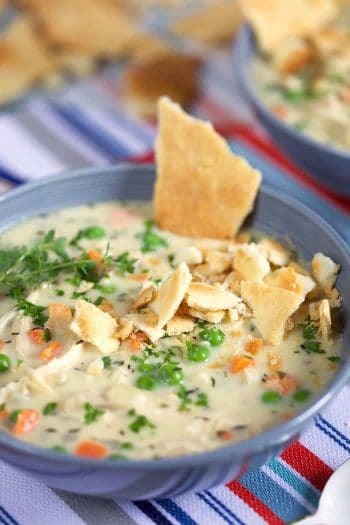 This slow cooker shredded chicken can be used to make buffalo chicken dip, sliders, Chicken Casseroles, Pasta Salads or in any recipe that calls for shredded chicken! 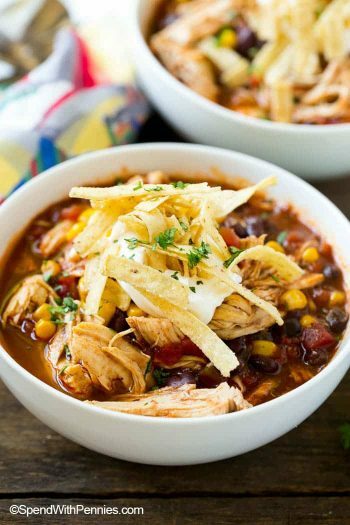 You can turn this recipe into shredded chicken tacos by adding in some Taco Seasoning. Or, you can serve it mound on a plate next to some beans and coleslaw for a delicious shredded bbq chicken dinner. 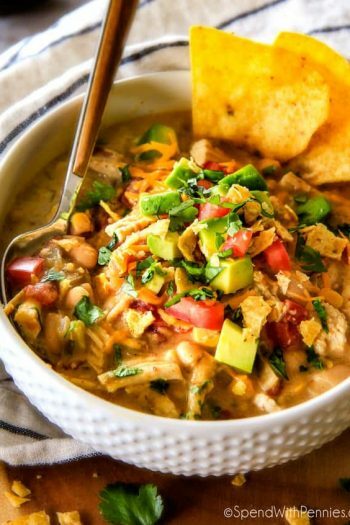 The list of variations you can make with slow cooker shredded chicken is endless! 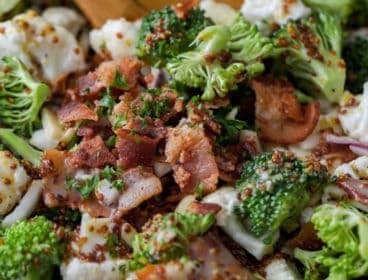 Prep it ahead of time and freeze it for easy meals in minutes! This easy Crock Pot pulled chicken is so tender and so flavorful! It’s perfect for any meal needing cooked chicken (like Chicken Parmesan Casserole or even for making homemade Chicken Salad sandwiches). 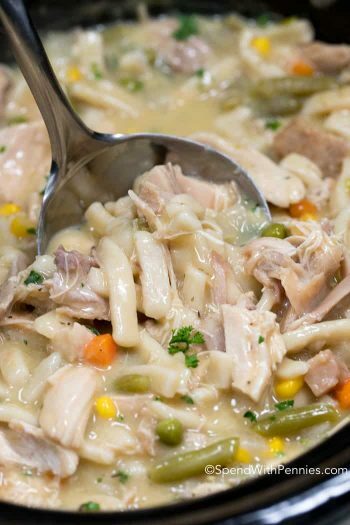 Can I Put Frozen Chicken In The Crockpot? Official food safety experts caution against putting chicken in the slow cooker. The concern is that the slow thawing process means the chicken will linger too long in the danger zone, between – 40°F – 140°F – when bacteria can multiply. 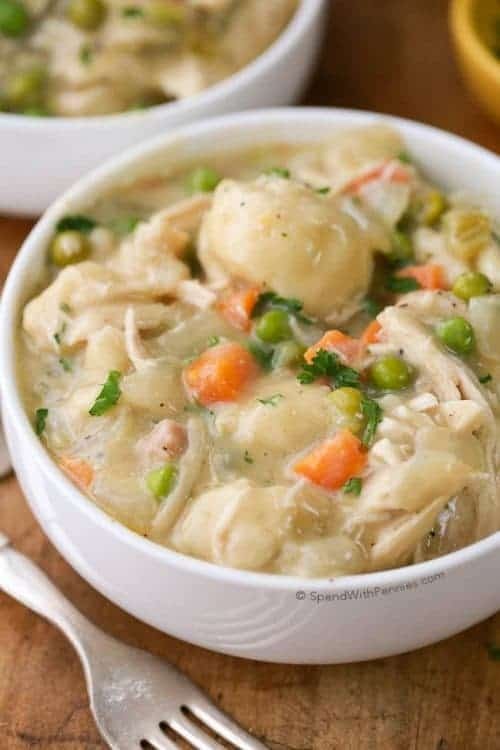 While I don’t recommend it, the reality is, many cooks put frozen chicken in a Crockpot by cooking the chicken on high at first until it is 165°F. I would suggest defrosting your chicken breasts (instead of cooking frozen) by placing in a sealed freezer bag. 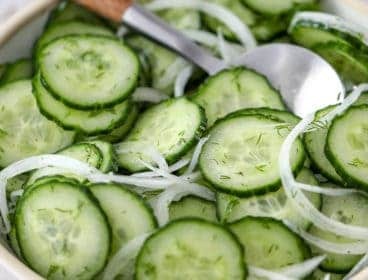 Place the bag in a sink or bowl of cold water. Change the water every 30 minutes. Chicken breasts (that are frozen separate and not in a large clump) should be defrosted within 30 minutes or so. 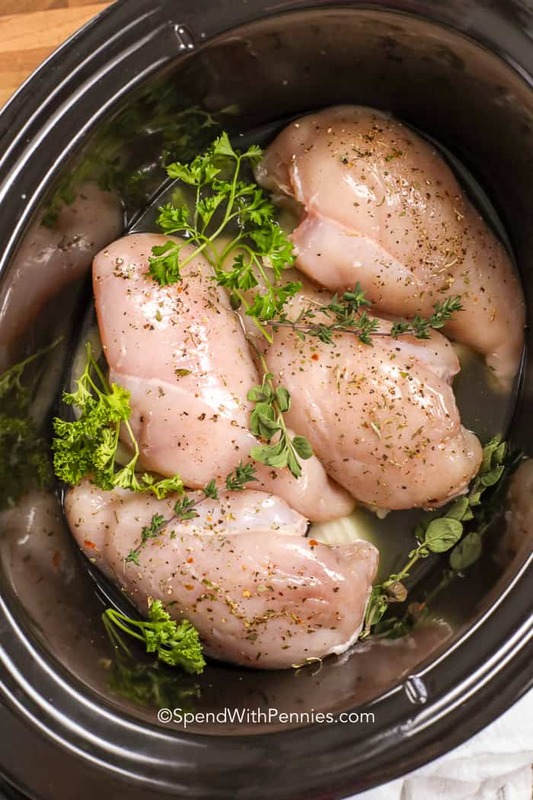 The best and fastest way to make crockpot shredded chicken is to start with boneless, thawed chicken breasts. 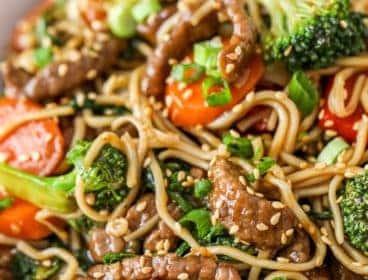 This recipe can easily be adapted to whatever savory herbs, spices or sauces you prefer. You need a little broth to keep the chicken moist as it cooks. Layer sliced onion, chicken breasts, broth and seasonings in your crockpot. 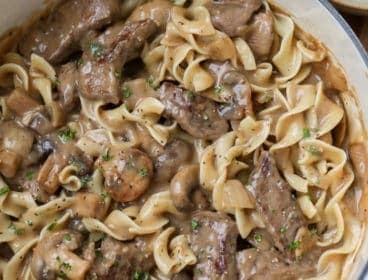 Cover and let the slow cooker work its magic. Remove chicken and shred with two forks. Stir in some of the slow cooker juices if desired. If you are planning to make shredded chicken bbq, then you can substitute some boneless chicken thighs for all or some of the breasts. 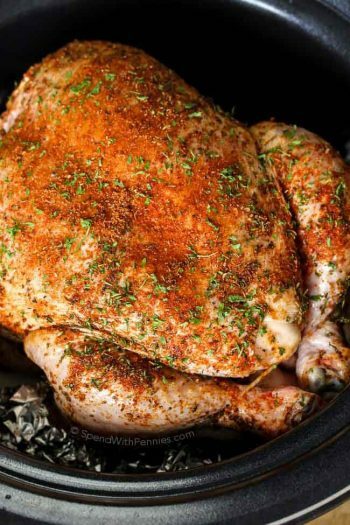 Dark meat has more poultry flavor, and benefits from spicy, vinegary sauces. To get the consistency right for shredded cooked chicken, you have to cook longer than you would if you were making cutlets, for instance. Remember that all slow cookers vary somewhat so you may need to adjust the timing to find the ‘sweet spot’ for your slow cooker. 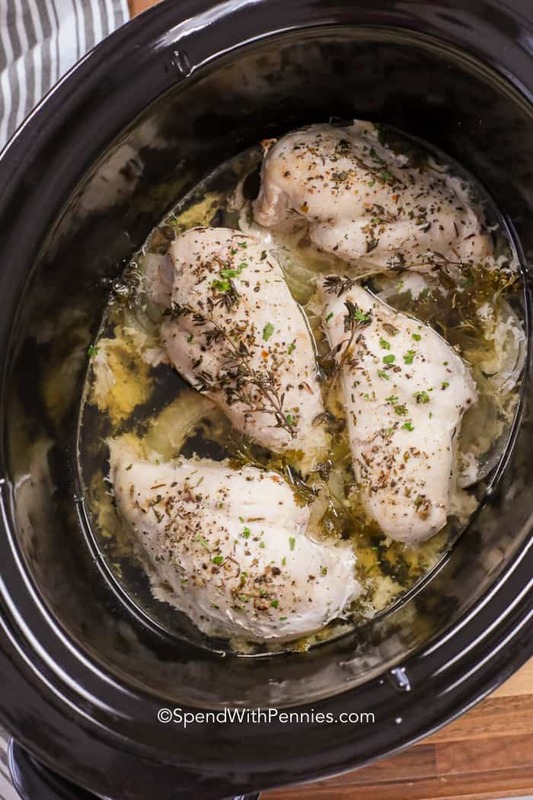 If you are starting with four boneless chicken breasts (7oz each), set the crockpot on high for 2 1/2 hours and it will be ready to shred. This easy pulled chicken recipe can also be cooked on low for 5 hours or so. Keep in mind, chicken breasts can range in size from 5oz to 10oz so its important to note the size. Larger chicken breasts may need longer while smaller chicken breasts may cook quicker. You’ll want to ensure they reach a temperature of 165°F. 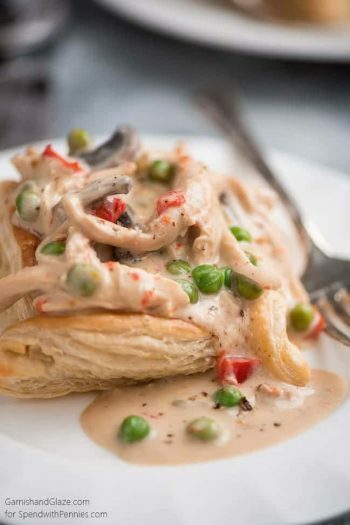 How to Make Poached Chicken – also easy! Easy Grilled Chicken Breast – great for salads! 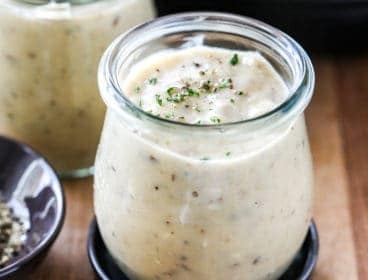 How to Make Homemade Chicken Stock– so much better homemade! 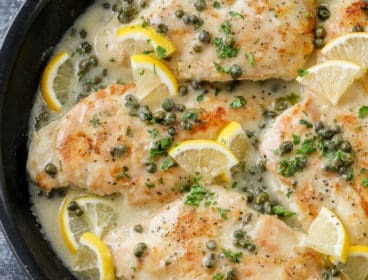 Oven Baked Chicken Breasts – perfect chicken! 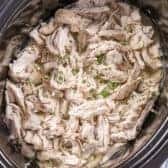 Crockpot shredded chicken is my favorite way to make an easy lunch, dinner, or snack. In the bottom of crock pot, layer onion, chicken breast, seasonings and herbs. Add broth. Cook on high for 2.5-3 hours (or on low for 5-6 hours). Using 2 forks, shred chicken. Stir in some of the juices/broth. Chicken breasts can range in size from 5oz to 10oz so its important to note the size. Larger chicken breasts may need longer while smaller chicken breasts may cook quicker. Ensure chicken reaches 165°F before shredding.